Bad dental hygiene – Failing to brush and floss on an everyday basis can make it easier for plaque and harmful bacteria to accumulate on the teeth. Even when these habits are followed, however, some plaque and bacteria may remain on the teeth, making it important to receive a routine dental cleaning at least twice a year. Smoking – Smoking and/or the use of other tobacco products can diminish the gum tissue’s ability to repair itself. Medication – Certain medications have side effects that can increase the possibility of developing gum disease. For instance, medications that may cause dry mouth tend to limit the production of saliva, which naturally serves as a protective barrier for the teeth. Medical conditions – Particular illnesses and medical conditions can have a negative effect on the condition of the gums. Such illnesses include cancer, HIV, and even diabetes. Hormonal changes – Puberty, pregnancy, and other periods of hormonal fluctuation can lead to sensitive gums, sometimes making it simpler for periodontal disease to develop. Family history – In some cases, a history of gum (or other dental) disease can factor into the formation of periodontal disease. 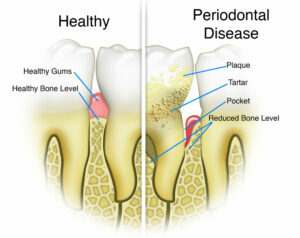 No matter its cause, the earlier gum disease is identified, the better the opportunity there is for successful treatment. For this reason, our dentists – Dr. Don Chiappetti and Dr. Jonathan Coombs – recommend all individuals schedule a dental visit at least twice a year. Should any signs of periodontal disease be identified, all potential treatment options can be reviewed, and the most effective method can be employed before the condition has time to progress.